Great news! TNM 2 release is still fresh, but we’ve already got another treat for you. And this time it’s not just a new version, but a proper release of a brand new tool for remote software deployment in local networks: Total Software Deployment! What can Total Software Deployment do? To start, TSD offers a simple and intuitive network scanner, borrowed from well-proven Total Network Inventory. It allows to quickly scan all MS Windows computers in the network to be able to start deploying to them. TNI users don’t have to bother with scanning and may simply use their TNI Network storage with TSD. Add any installer to TSD – it will be automatically stored in the Software storage. 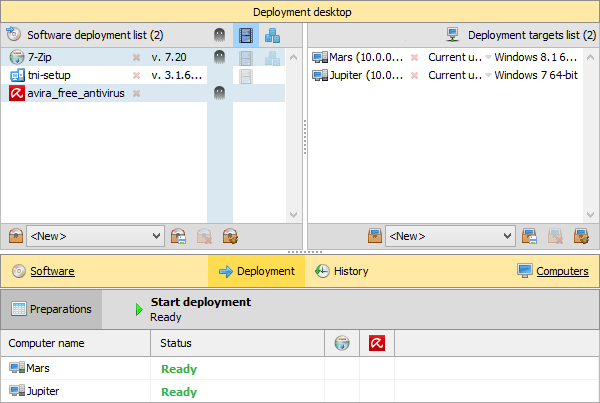 Then create a deployment scenario and select the computers to deploy to. All that remains is to press Start deployment. Created scenarios are also saved in the Software storage for future use. The program can create deployment scenarios for any kind of installer, be it MSI or EXE from a third-party developer. To ensure correct operation of the newly created scenario, you’ll be able to test it locally before deploying to selected computers. Total Software Deployment will help you keep your software up to date by automatically scanning your network computers and building a software inventory report. You’ll see which programs are installed on each computer, discovering outdated installations at a glance. And most importantly: remote deployment does not distract remote users from their work! Detailed information about program features is available on the Total Software Deployment webpage. If you have questions or suggestions, please contact our support. By purchasing Total Software Deployment you’re getting a lifetime license and free technical support. All types of licenses are already available from our store. During a successful beta test, discovered faults were fixed, and task lists were filled with new ideas for future implementation. As promised, all users who actively participated in beta testing by submitting bug reports or feature suggestions, will receive a free license for 25 computers. We’ll send out the free licenses next week. If you actively participated in the beta testing program, but haven’t received your license within a week, please drop us an email. And don’t forget about the Send Feedback button. Your feedbacks and bug reports made this release possible. Please continue sending them in, so that TSD becomes even better!